The spring racing season is complete! This past training cycle was extremely successful. I started off the year with a solid PR at the Fred Lebow Manhattan Half in January and did even better in March at the United Airlines NYC Half. 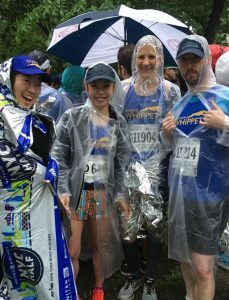 The Popular Brooklyn Half on Saturday, May 19th, was my final major race for the season so the pressure was on! 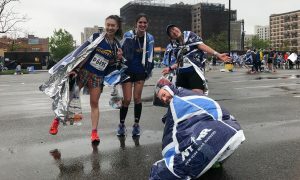 Here’s a recap of everything leading up to the Brooklyn Half and how it all went down on race day. When I ran sub-1:50 at the United Airlines NYC Half in mid-March, I set a goal of running 1:45 at Brooklyn. It’s a moonshot but I knew that going into the race, the course would be extremely advantageous and I was guaranteed a big PR. 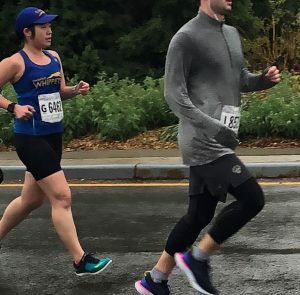 I had less than two months to train for Brooklyn, the shortest time frame I’ve spent to get ready for a half marathon. I went into training every week with the mentality that I can’t afford to miss out on a workout. This might have been one of the most difficult challenges to overcome. I was committed to my training so I was adamant about getting every single workout in. Every Tempo Tuesday and Speed Thursday, I was there – and if I wasn’t, I made up the workout. I was borderline heading into the over-training territory and forgot about the importance of listening to my body. Luckily, I didn’t get severely injured since I’m good about scaling the workouts. But by the time taper week arrived, I was completely burned out. Every time I have a major race, I tell myself, “Trust your training!” But this time was the hardest to put this mantra into practice. All the “shakeout runs” I did during taper week felt hard. Even though 8:25was my half marathon pace, maintaining a 9:45 during those “easy” runs felt strenuous and I didn’t know what was wrong with me. I was tempted to DNS (did-not-start). I was that exhausted. Saturday morning (race day) started at 4:00am, too early if you ask me. Two rice balls and a cup of coffee later, I was out the door to meet teammates in my neighborhood to share a car down to the starting line. Fortunately, we arrived early enough and the entire process to drop off bags and get through security was seamless. Unfortunately, the weather didn’t hold up and I was faced with racing in 52 degrees and rain. I was afraid of reliving Staten Island Half 2016 all over again but the winds were a lot calmer so it ended up being pleasant. My strategy going into this race was to run steadily for the first half and then speed it up. I’ve become increasingly better at executing negative splits but always find it a challenge to cruise into a steady pace from the beginning. I’m usually too conservative so I aimed to start out a tad bit faster than usual. I had a Whippet racing buddy (Megan, you’re the best!) and when we checked in at the halfway point, we were right on target with the pacing. The Ocean Parkway portion of this race is a love-it or hate-it thing. It was exhilarating to dash through this straightaway road and I felt like an engine! But in the last few miles, I started to struggle mentally. The exhaustion was catching up and I could barely hold onto my pace. I knew that 1:45 wasn’t possible at mile 10 but at the very least, I wanted to PR and bring my average pace down to get into corral D.
Although I was mentally and physically exhausted from this 5-month training season, I am proud that I came out of it with a lot of wins. I finished this race with a new half marathon PR of 1:48:13, at 8:16/mile pace and my ticket into corral D! In the span of less than half a year, I shed off more than six minutes. But this process was anything but glorious. On many occasions, I went into workouts feeling defeated and compulsively complained to friends on runs. Plus, we had a lot of bad weather. But I’m truly thankful to be part of a team that pushes me despite my challenged attitude – they take my whining to winning. As I reflect back on this race and the spring training cycle, it’s still unreal how I much faster I’ve gotten in terms of covering this distance. 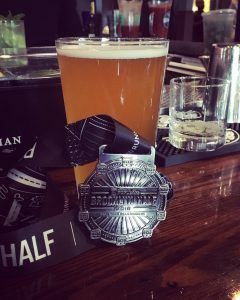 My first half marathon was done in 2:13:39 and since then, I managed to shed off over 25 minutes in the span of less than two years. I love that the faster I finish, the more time I have to hang out with teammates to celebrate. 1:45 didn’t happen this time around but you know that I’m after you! Now that this training cycle is complete, I plan on taking a mini-vacation away from running (I mean, aggressive workouts) and catch up on cross training. I want to work out for fun and take time to properly recover. When the fall training cycle for the NYC Marathon starts in the beginning of July, sore hamstrings and stiff calves will be my life so I need to be ready and rejuvenated.